PT United Tractors Tbk - UT (IDX:UNTR) more popularly called "United Tractors" is a reputable public-listed company in Indonesia, running business in the field of heavy equipment and mining industry. Headquartered in Cakung Jakarta, United Tractors has three business competencies: Construction Machinery, Mining Contracting and Mining. PT United Tractors Tbk is a heavy equipment and mining subsidiary company of PT Astra International Tbk (Astra Group, IDX:ASII), a large and solid business group in Indonesia. Currently, United Tractors is 59.50% owned by Astra Group and 40.50% by general public. 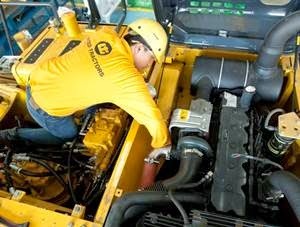 As United Tractors supported by 19 branch offices, 22 site support offices, 11 representative offices, 14 mine offices, 39 workshops, 8 remanufacturing facilities, 117 warehouses spread all over Indonesia. PT United Tractors Tbk also supported by 12 subsidiary / affiliated companies. In term of financial position, United Tractors recorded net revenue of Rp33.9 trillion in the end of third quarter of 2016 (3Q 2016, ended in 30 September 2016) or down 11%, compared to Rp38.3 trillion in the same period in 2015 (3Q 2015). Total net profit in the end of third quarter of 2016 amounted to Rp3.1 trillion or a decrease of 44% from Rp5.6 trillion in n the same period in 2015, according to PT United Tractors Tbk 3Q 2016 financial report as cited by JobsCDC.com. Background in Bachelor Degree (S1) all major, GPA min. 2.75. Open for final year students who will graduate before April 2017. Willing to be assigned in all site and branch office around Indonesia. JobsCDC.com now available on android device. Download now on Google Play here. Please be aware of recruitment fraud. The entire stage of this selection process is free of charge. PT United Tractors Tbk - Fresh Graduate Consultant UT Astra Group December 2016 will never ask for fees or upfront payments for any purposes during the recruitment process such as transportation and accommodation.